The Soroptimist Live Your Dream Award assists women who provide the primary source of financial support for their families by giving them the resources they need to improve their education, skills, and employment prospects. 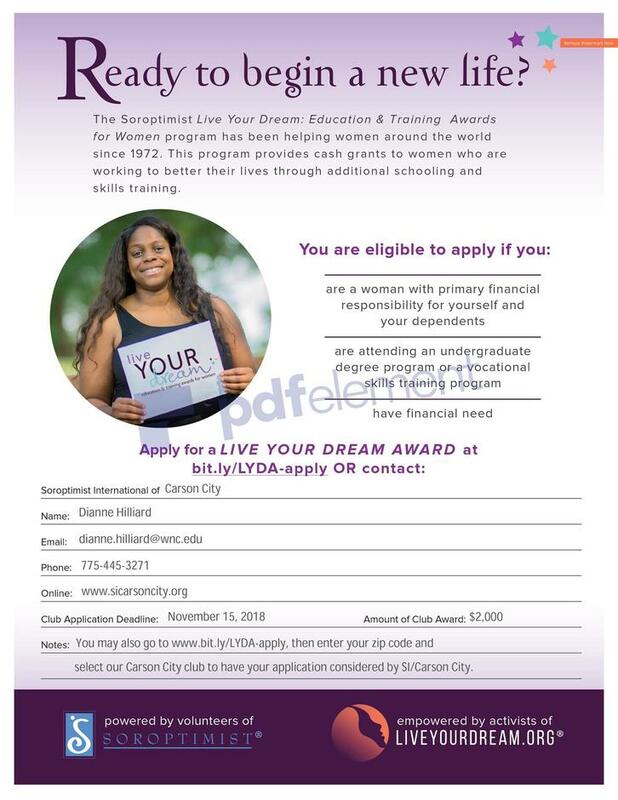 Live Your Dream Award recipients may use the cash award to offset any costs associated with their efforts to attain higher education, such as for books, childcare, tuition, or transportation. Applicants may also be considered for Club tuition Scholarships. Applications are due by November 15. Please read all criteria and follow all instructions. Ineligible applicants, incomplete applications, or applications submitted without reference forms will not be considered. Reference forms from two different people, not related to you, are required - reference letters are not acceptable. Priority consideration will be given to Carson City residents, but is not a requirement. Club recipients become eligible for Region-level awards; those recipients in turn become eligible for Finalist awards. Each year, about $1.7 million is awarded through the Soroptimist Live Your Dream Awards program. Since 1972, the Soroptimist Live Your Dream Awards Program has disbursed more than $30 million to tens of thousands of women who have overcome poverty, domestic and sexual violence, divorce, the death of a spouse, or other life challenges - women who had the courage and determination to turn their lives around.